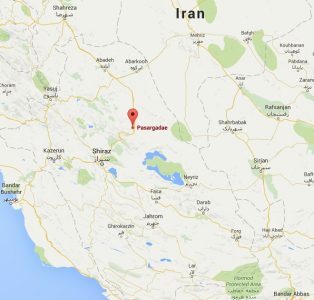 Pasargadae, the capital of Achaemenid Empire under Cyrus the Great, is located in 130 km distance from Shiraz city on its northeast. 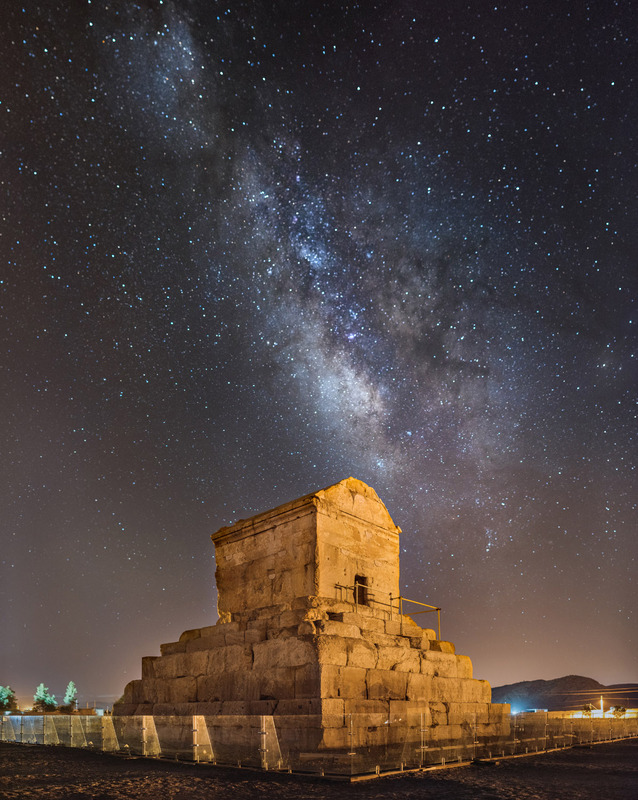 Cyrus the Great issued its construction (529–550 BC) after his victory over Astyages the last king of the Median Empire. 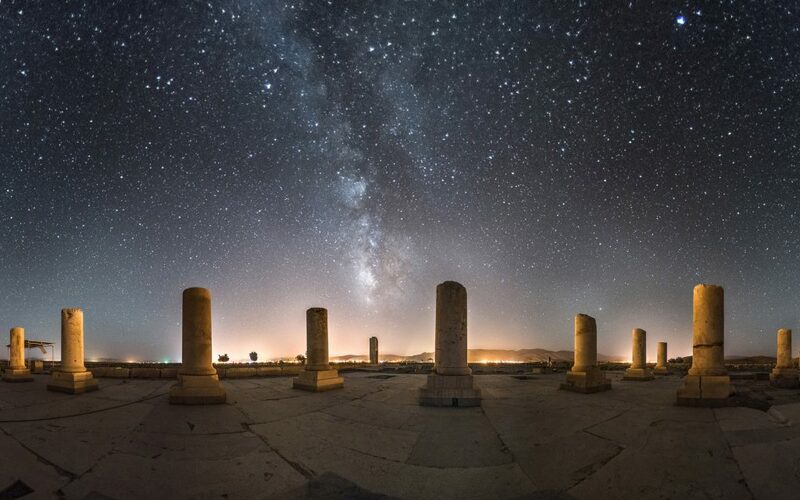 This complex is well known for its most famous monument, the tomb of Cyrus, but it also includes the prison of Solomon, Pasargadae Palace and citadel. Cyrus has issued the construction of this monument along with Pasargadae. This tomb consists of a chamber with sloping roof built on seven stone benches. In 336 BC when Alexander the Great invaded Persia, Pasargadae was destroyed and the entire treasury of the palaces and tomb of Cyrus was looted. This is a very important monument, as it is related to one of the most famous Persian Emperors and the history of Persia. It is for this reason that I had always wanted to immortalize the place at its best. The Milky Way is only visible on certain summer evenings where the sky is clear and there is no moon. My aim was to capture this valuable structure under such a star-filled sky. Nobody is permitted to enter the area of Pasargadae, therefore aside from having to find the perfect time and moment; I also had to obtain various permits in order to make this photograph a possibility. Royal palace of Cyrus with an area of 3427 km2 is one of the largest palaces of Pasargadae. 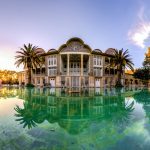 The creeks in the surroundings of this palace indicate the existence of Persian gardens in this area. In the photograph we see the remnants of the Audience Hall of the palace with 30 white columns. Plenty of black and white stones were used in this buildings structure. When I was taking this photo, for a moment I was stunned and lay on the ground for several minutes, staring at the sky, imagining I was there thousands of years ago, at the time that Cyrus the great lived with his council, ruling the greatest empire of all time; Persia. Do not miss other Images in my Night Shots gallery. 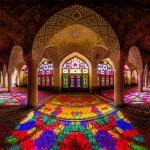 I so regret not having gotten down to Shiraz when I lived in Iran years ago. Maybe now that Irani-American relations are thawing just a bit, perhaps it will be possible before I’m too old and decrepit to make the trip.